This is old version ooVoo 2.8.1 apk for Android, you can install it if you want to downgrade or install old app. It is top Social apps from ooVoo LLC. Another point which needs to remind is about the minimum age of the users of the mobile software. This chatting application has its standard dealing with the users’ maturity or the minimum age of 13. It is important to keep someone’s privacy once it deals with online software to prevent any cyber-crime which exists today. The last thing for you to know is about the users’ satisfaction dealing with the services or features provided. From some reviewers, this application is in an average to high standard which makes it gets the rating for about 4/5. It also has a good quality of voice and video, so to say at the least that this application provides good facilities. Furthermore, the use of this application is quite easy to understand. In addition, you can add and synchronize the account from your Android phone to desktop version. 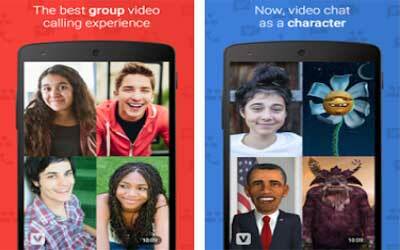 That is why ooVoo for Android is categorized as one of the best applications for you who like chatting and calling. Free Video Calls, Voice Calls, and Texts – you and your friends can chat as much as you want. ooVoo works with your Wifi network or data plan to make sure all your calls and texts are free. Free Video Calls – up to 12 people in a high-quality video chat using our own SuperClear™ technology over 4G, 3G, LTE and WiFi without increasing data consumption. Amazing audio during a call – echo cancellation and crystal clear audio to make you always sound great. Free Voice Calls – talk to friends and family right next door or across the world, as long as you like. Free Texts – send messages, photos and videos to your friends, even during a call. Free Group Chats – enjoy group chats with integrated one-touch calling to easily move from a chat to video call. Change group name and picture. Fewer dropped calls – our video technology automatically detects and adjusts for connection speed, which means less dropped calls on the same connection than other video chat apps. ooVoo everywhere – ooVoo is cross platform and works on any device. Available on over 300 popular Android phones and tablets, and we are always adding more! GIFs are here! You can now use your favorite GIF keyboard in ooVoo. Life gets a bit easier now that the ooVoo Store indicates when its updated with new content. We fixed a few bugs you never knew were there and made some other under-the-hood improvements.